What is one to do when two eateries, literally located next to one another, are serving almost the exact menu items? Well, if you are me: I narrowed my eyes, shifted my gaze the between the two competitors and thought …. Welcome to the latest installment of Food Rumble! I love fish tacos whether they are the Baja style utilizing battered and deep fried fish or the healthier grilled fish. I was actually very surprised to see that both Feastro the Rolling Bistro and the Tacofino taco truck (sometimes parked side by side to each other near the art gallery) offer almost identical Baja style and tuna tataki grilled fish tacos. 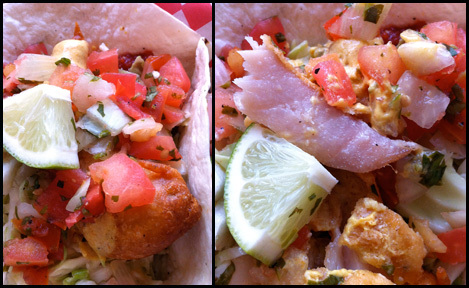 A comparison of downtown fish tacos would not be complete without including La Taqueria’s pescado taco to this rumble. When it comes to fish tacos, for me, the fish has the star! Everything else so be they to support the Fish and not take away from it. So let’s see how our contenders did. Feastro uses a six-inch flour tortilla as a base for all their tacos. A single piece of Red Snapper bathed in a chickpea batter is used. The offering is finished with a tomato & star anise chutney, shaved cabbage, tikka masala yogurt and hand cut salsa on top. I felt the fish was lost amongst the ingredients in this taco. The batter yielded a crispy piece of fish but I felt it needed to be even crunchier to stand up to the wet salsa, yogurt, and cabbage. The flavour of the snapper also didn’t stand up well to the bolder tastes of the other ingredients, especially the tanginess of the salsa and the star anise in the chutney. The fish just didn’t work in this taco – it needed to be meatier and much more crunchy. Feastro’s Tuna Taco was essentially a fusion of Japanese ingredients like Tuna Tataki, wakame, pickled ginger, tobiko and bonito flakes in a taco. In addition to the Japanese ingredients there was shaved cabbage. 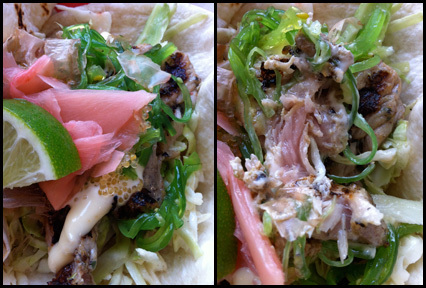 Unlike the deep fried fish taco, the single piece of grilled albacore tuna stood out. The tuna tataki was grilled on the outside, but raw on the inside. You could taste the charring from the grill and the creaminess of the tuna. You could taste all the components, which lent a different taste and texture to the taco. The only thing I really couldn’t taste was the bonito flake. However, I felt some of the ingredients with stronger flavours like the wakame and pickled ginger overwhelmed the Tuna at times. As a result the taco was good but could be better. Tacofino also uses a six-inch flour tortilla as a base for all their tacos. In this taco you got two pieces of deep fried ling cod done in a tempura style, shredded cabbage, salsa and chipotle mayo. Since they were prepared in chunks, the deep fried ling cod held its own in this taco. It was crunchy and flavourful even with the presence of the tomato heavy salsa. The cabbage gave this taco a little more texture but the star of the show was the fish. This was a well executed Baja style fish taco. Much like the Feastro version, I was concerned with all the ingredients in the Tacofino Tuna Ta-Taco. It contained 2 pieces of tuna tataki (grilled alabacore tuna), a soy dressing, sesame, wakame, pickled ginger, wasabi mayo, shaved cabbage and salsa. This taco was a mess. Although the tuna was prepared perfectly, the soy dressing overwhelmed everything. All you could taste was the extremely salty dressing, hints of the tuna and pickled ginger. All the other flavours that could have been in this taco were lost. In addition, I felt the texture was a little off. Everything in the taco felt mushy including the cabbage, which was strange. La Taqueria is the only contender that uses a corn tortilla, which are half the size of the flour version used by Tacofino & Feastros. Unlike the flavourless flour renditions that simply serve as a vessel for the fillings, the corn tortilla adds a subtle roasted sweet corn taste. The filling for the Pescado taco is made with a white fish in the zarandeado technique. The zarandeado method is a traditional fish preparation hailing from the Pacific coast of Mexico. The whole fish is split into 2, marinated (usually with soy sauce and other spices), sometimes brushed with mayo and then grilled. Not sure if La Taqueria follow the technique faithfully but the fish tasted sweet, creamy and salty with a little bit of spiciness. The taco was top with a salsa, slices of radish, a few shreds of cabbage and thinly julienned white strips, which I think were diakon radish (not 100% sure). The salsa provided tartness to the taco while the other vegetables provided a crunchy texture. I really like this fish taco as it was flavourful without being complicated. 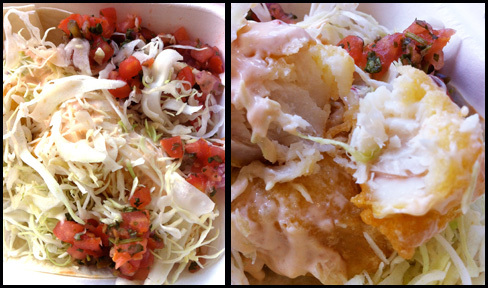 After trying all these fish tacos, Tacofino’s Baja style deep fried taco was the rumble winner hands down. Between the two Tuna Tataki tacos, Feastro’s was the better executed as the ratio ingredients used worked better and allowed all the components to be tasted. 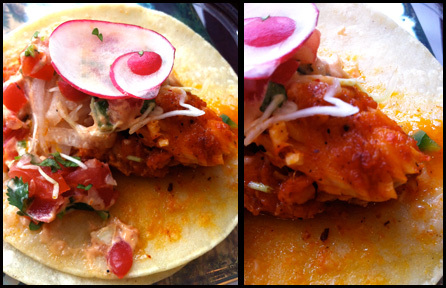 However, in the non-deep fried fish taco group La Taqueria’s Pescado taco was the best. I felt the 2 two tuna tataki tacos from both trucks used too many ingredients that often competed with one another and the wonderful albacore tuna was not the star. It seems both eateries wanted to do a Japanese fusion taco to appeal to Vancouverites’ love of Japanese cuisine and as a result crammed all the Japanese ingredients that could get their hands. In this case, less would have been more (lose the wakame, tobiko and bonito) and that’s why I preferred the Pescado taco. The zarandeado style fish was the star and all the other ingredients were complimentary and served a purpose. Next Post Wow, You’ve Got Something There! – I love Peppadews!